Derry City and Strabane District Council says it will continue to clamp down on irresponsible animal owners, following a successful prosecution at the local Magistrate’s Court. Patrick Collins, of Lower Nassau Street, Derry, was sentenced at Derry Magistrate’s Court after pleading guilty to causing unnecessary suffering to a brown terrier dog in his care in August 2015. The charges related to findings following an investigation by PSNI and Animal Welfare Officers regarding offences in August 2015. Mr Collins received a three month jail sentence in respect of each charge to run concurrently. He also received a lifetime ban from keeping animals and was ordered to pay £909 costs. CCTV footage had been previously shown in court on the 15th December 2016 of the terrier dog on a lead being dragged along the ground on its side like a dead weight. The dog was seen on the CCTV footage to be trailed out the front door of the shop. The dog was examined by a vet and found to be unresponsive and motionless, its breathing was slow and heavy and its prognosis was poor. There were cuts to the pads of all four feet which indicated that the skin had been grazed off. The dog was hospitalised and put in an oxygen tent – but made a full recovery before being rehomed by Council. 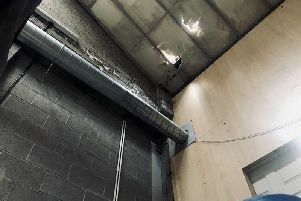 Commenting after the proceedings, a spokesperson for Derry City and Strabane District Council, welcomed the Court’s ruling saying: “It is upsetting to hear of cases of the mistreatment of animals in our society. However, I am gratified that Derry City and Strabane District Council continues to adhere to a rigorous enforcement policy to ensure full compliance of regulatory requirements. “I would urge the public to be vigilant and report any suspected cases of mistreatment or cruelty to domestic animals and equines to our Animal Welfare team on 028 82256226. “Complaints are investigated thoroughly and where necessary formal action is taken, which may include the service of Improvement Notices or, in extreme cases, the seizure of animals. Members of Derry City and Strabane District Council’s Health and Communities Committee this week received an update on the ongoing campaign to address animal welfare issues across the district. The latest figures show that from 2nd April 2015, the Western Region alone has received over 995 animal welfare calls and carried out 1390 inspections, 441 of which were carried out in the Derry City and Strabane District.